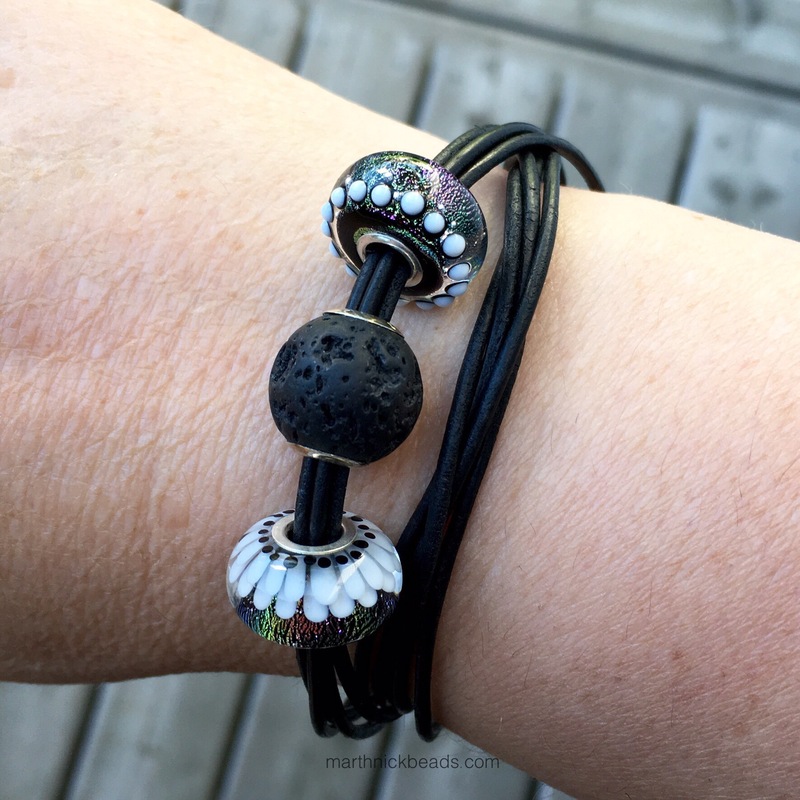 Yesterday’s blog post showed two Beauty Beads by Perlen and the Beauty String Leather Bracelet. Today I’ve got photos of four more beads. Two of them are hand painted porcelain and two are glass. 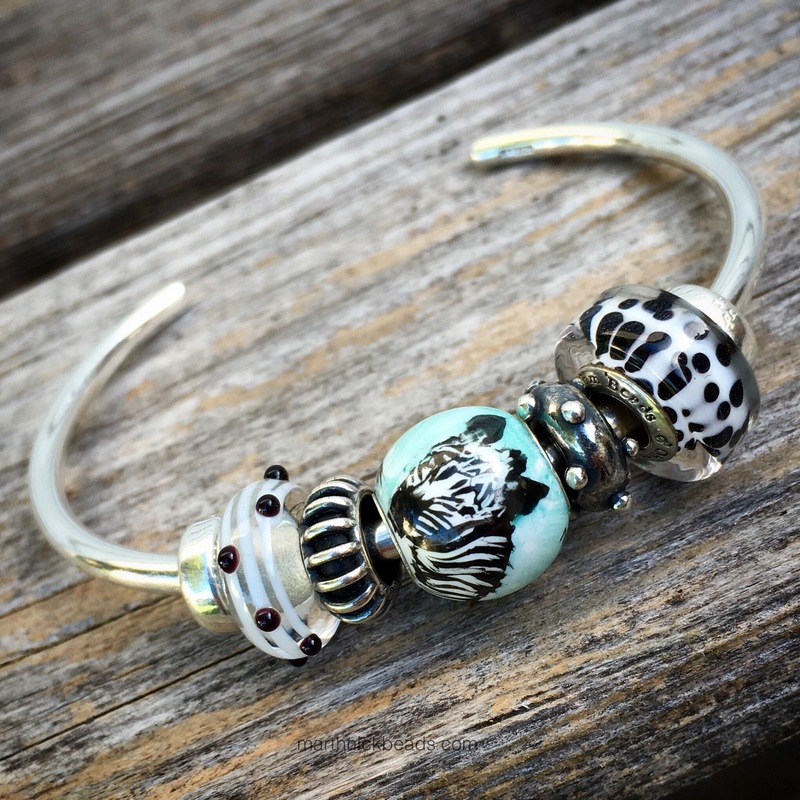 First up is a Bernardi bead-a Zebra hand painted on a porcelain bead, from their safari collection. This is one I will especially enjoy wearing when teaching younger kids this year. Here is is on the black leather bracelet. 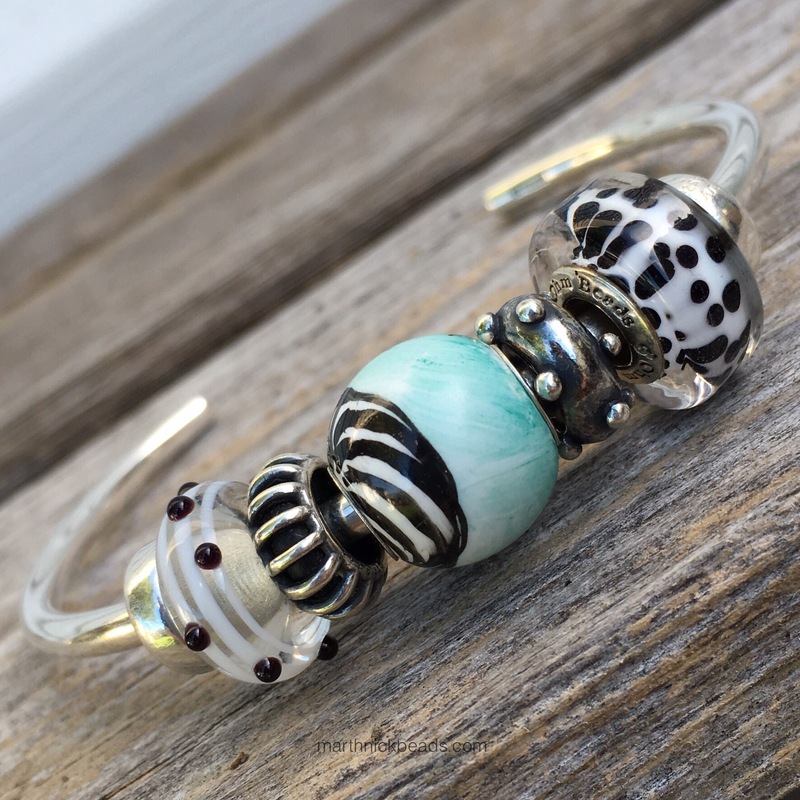 I like it on a bangle with some black and white beads. 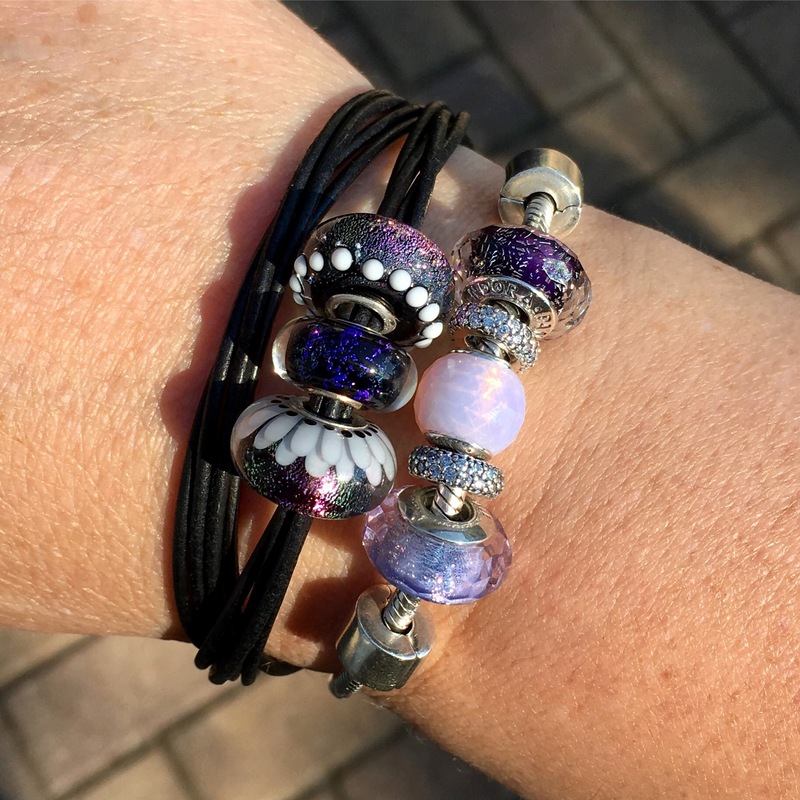 Left to right are the Trollbeads Black Dot, Sunbeam Spacer, Bernardi Zebra, Trollbeads Dot to Dot and the Ohm Beads Dalmatian Dactylogram. Here is what the Zebra bead looks like from the back. 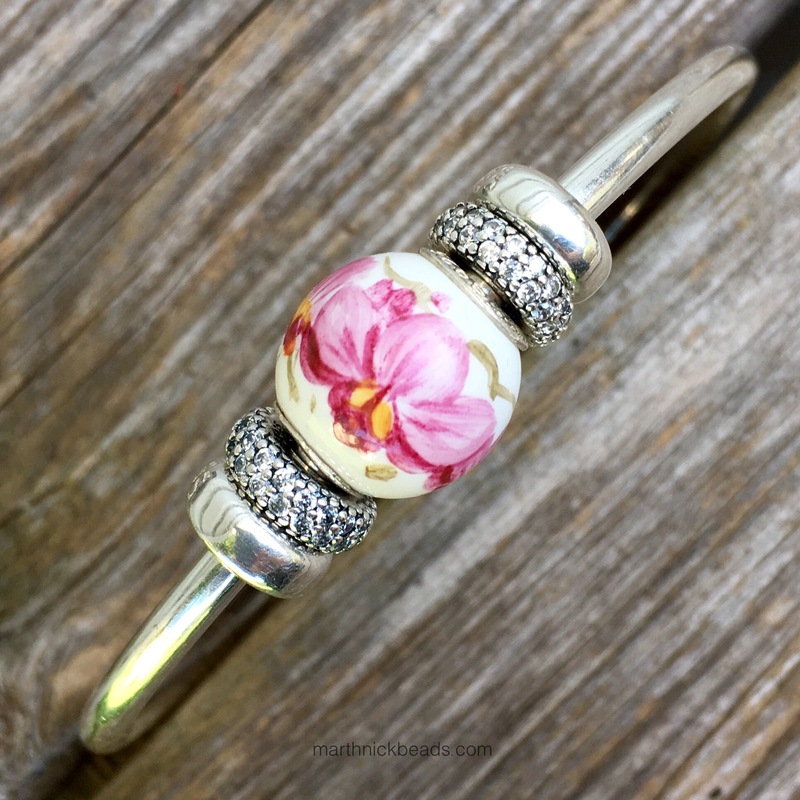 The other hand painted bead I’d like to show is called Orchid. There are also some Hallowe’en ones! 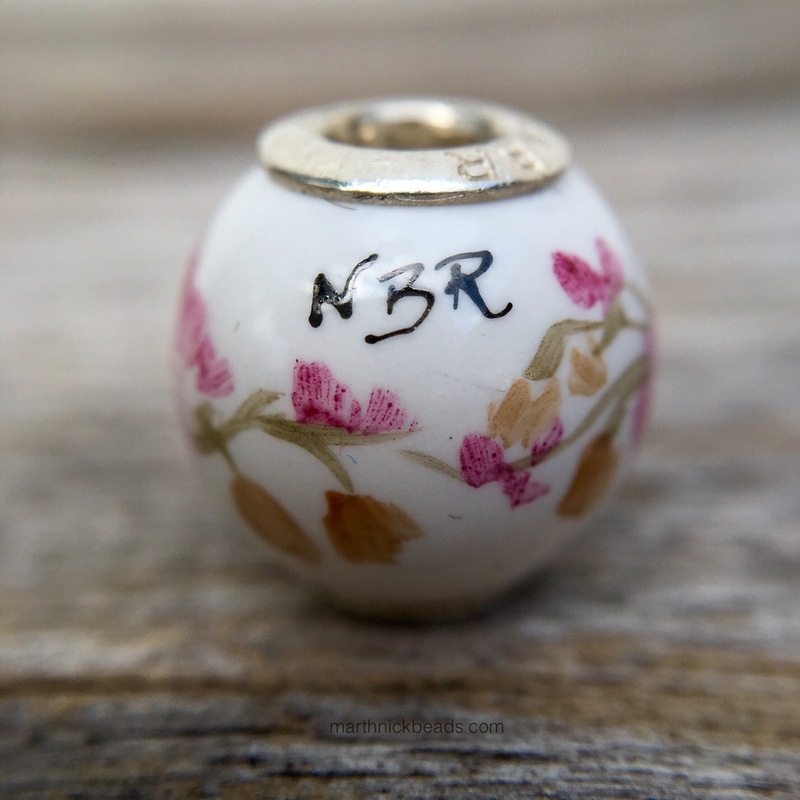 Here is the Orchid bead from one view, showing the initials of the artist. 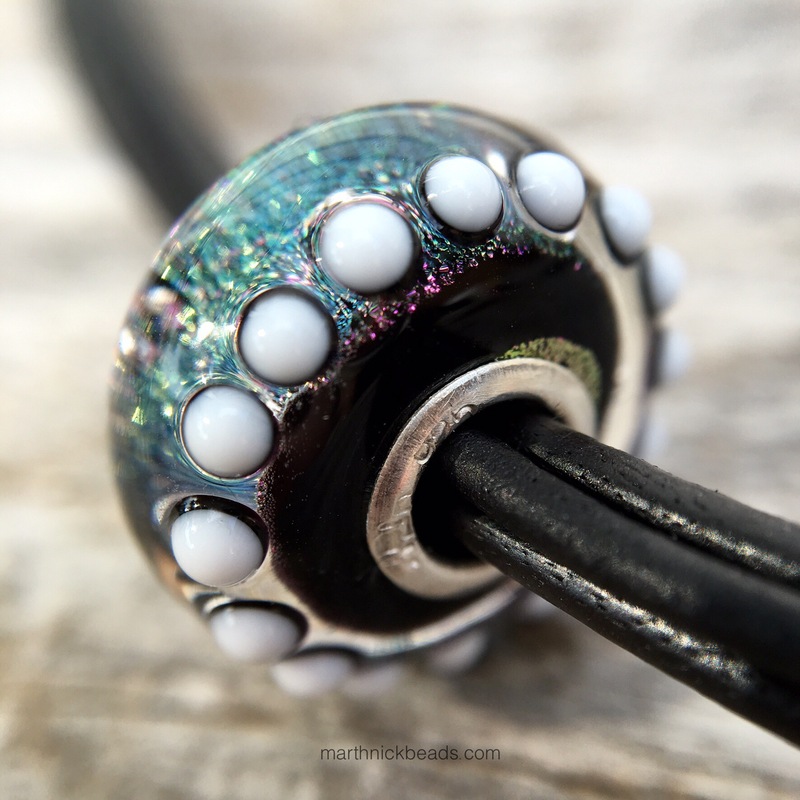 This bead makes me think of a delicate tea cup. This is the front. I put it with a couple of sparkly Pandora spacers. 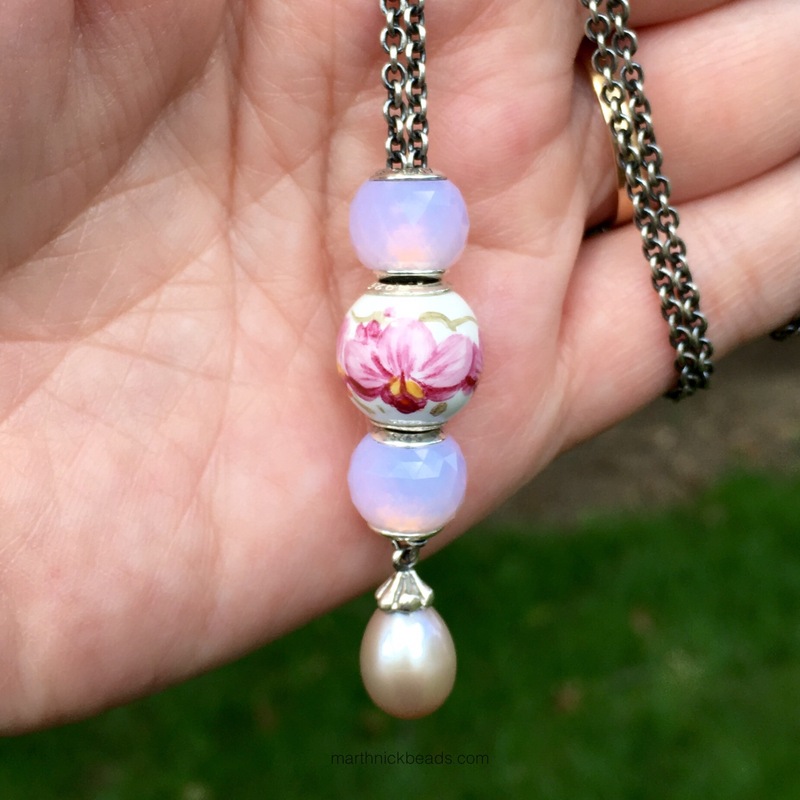 I tried the Orchid bead on my Fantasy Necklace and think it looks pretty! Next up are a couple of glass beads that I’ve already shown on Instagram. They are super sparkly and I love them! First is the Beauty Bead called Elvira. This one looks incredible in the sun. The little silver balls inside give an added dimension. Here it is from the other side. Again, those little drops of white are incredibly evenly spaced. 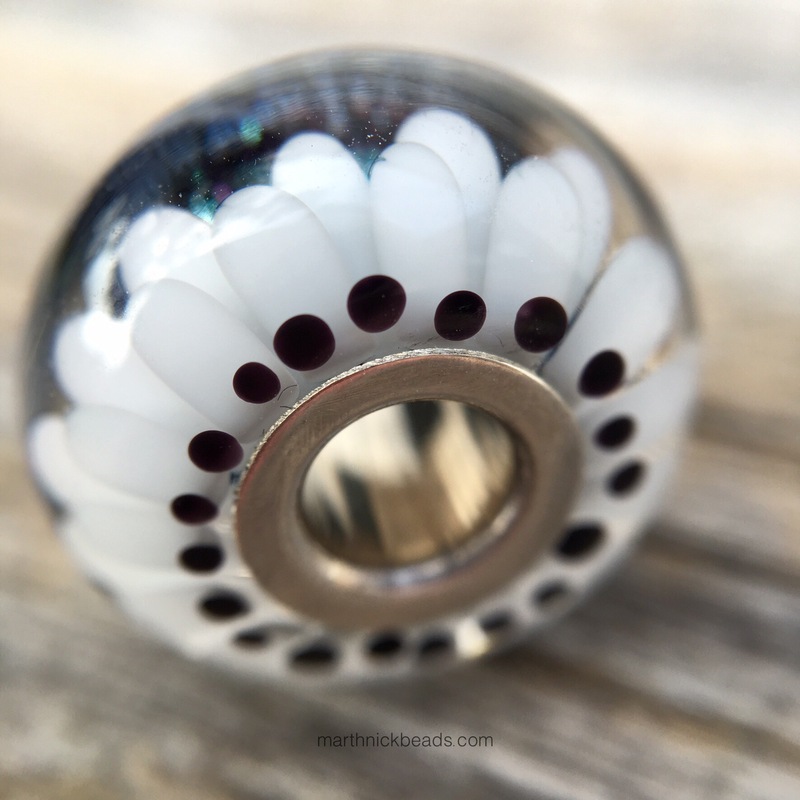 The other glass bead for today is called Mermaid Flower, White. I paired them with the Redbalifrog Volcanic Fossil bead. 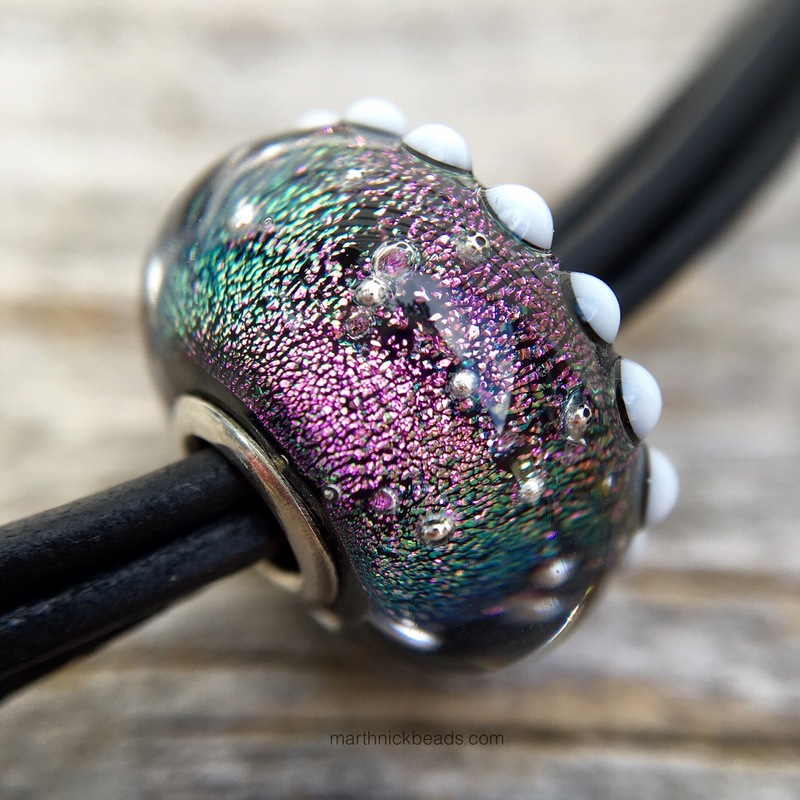 Lastly, here is a bangle with some Trollbeads Spacers, a Pandora Purple Shimmer and the two sparkly Beauty Beads! I will be wearing this today as I love how they look together. I will be keeping my eye out on the whole Beauty Bead line as in my opinion they are really gorgeous beads. 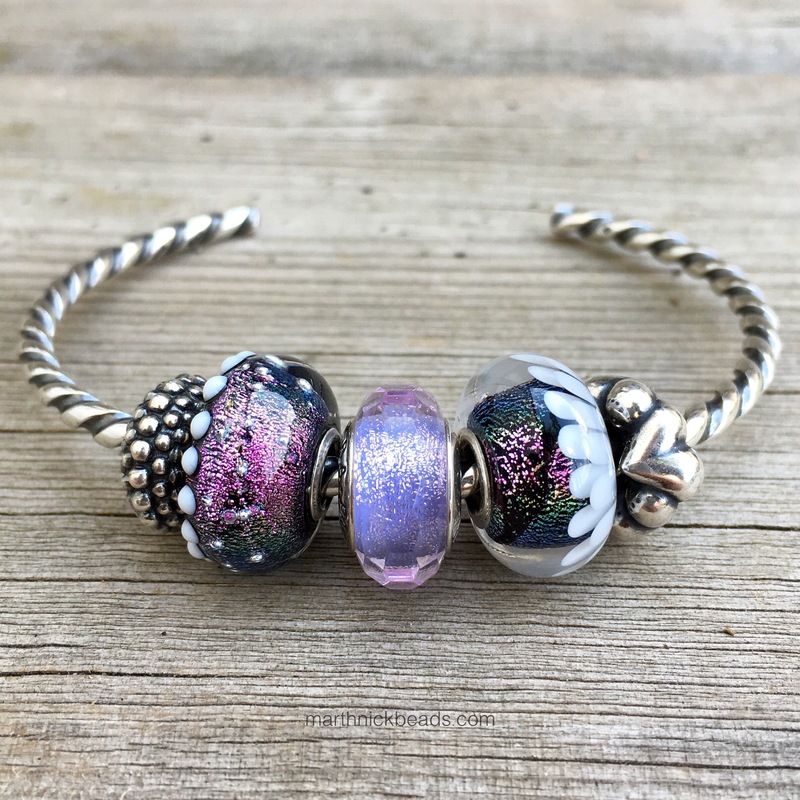 Is anyone thinking of adding Beauty Beads to their collection? 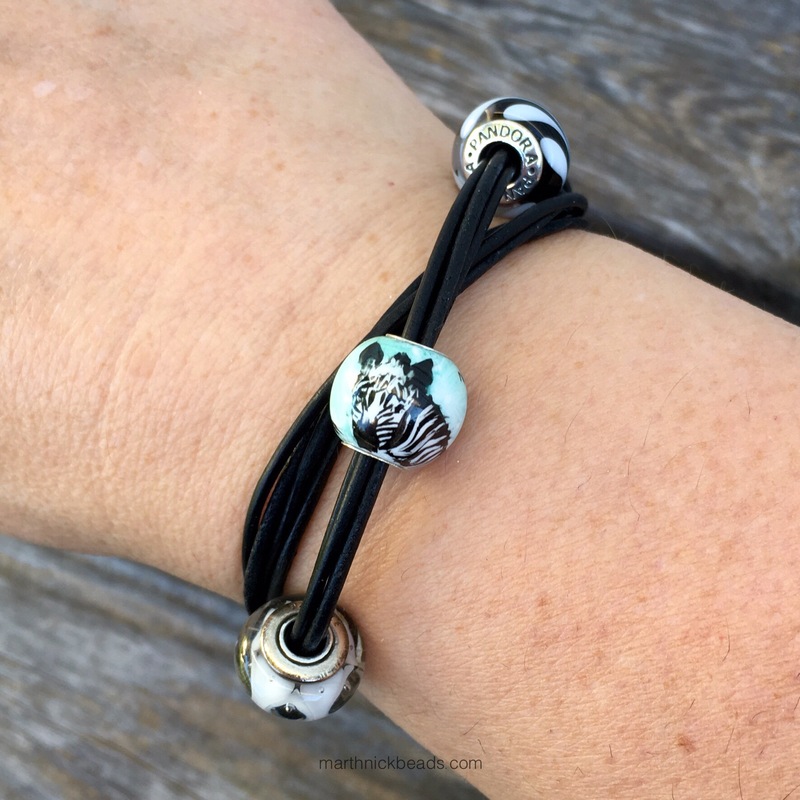 The bangle combination with the zebra is really nice! Last year, I bought the painted jack O lantern and wore it a lot – it is one of my favorite Halloween beads. I can see why the painted Jack o’ Lantern is one of your favourites for Hallowe’en as it’s rare to find beads with orange and black on them. 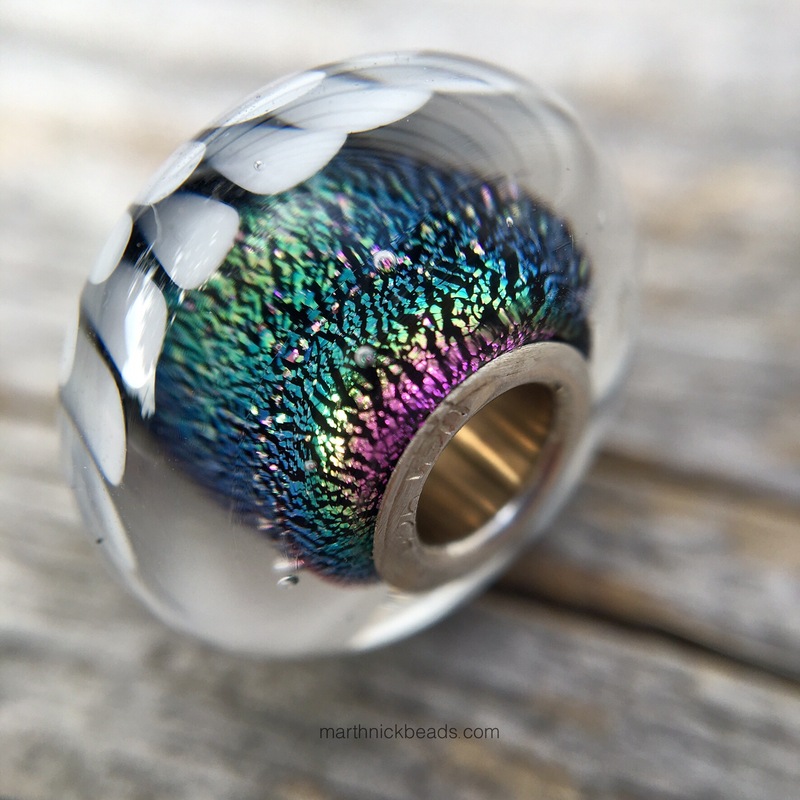 I am loving the photos of the glass Beauty Beads. They are vibrant and have interesting textures. I’m really enjoy them April. The shimmer is just incredible and as you say, have an added interest with the textures. Carol, I was wondering if you’d like the Orchid bead as I know you have a teacup collection! If you look online there’s one called Thistle that’s also very pretty.